A new deal may help India’s Tata Group pull off its biggest innovation yet. You may already be familiar with the Tata Nano, a $2,000 automobile designed to compete with motorcycles as a means of affordable motorized transportation for lower-income families. It’s possible you have also heard of the Tata Swachch (Hindi for “clean) – a $21 water purifier that does not require electricity and whose filters last over 200 days. Now, Tata Group chairman Ratan Tata has signed a deal with MIT startup SunCatalytix to commercialize new research that may produce cheap power from water. SunCatalytix attracted Tata’s attention because it found a way to generate electric power from a jar of water. Nocera and his team had a theory that they could mimic photosynthesis – the way plants generate energy from the sun – by using simple and affordable materials. Only 45 days ago, they validated their hypothesis by inserting an artificial cobalt- and phosphate-coated silicon leaf into a jar of water. 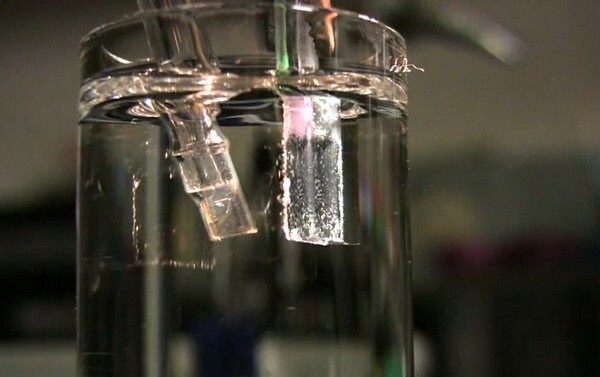 This created a chemical reaction that generated energy by splitting hydrogen from water. Nocera’s research is still in preliminary stages. By next year, he expects just 1.5 bottles of water to generate enough energy to power a small house. The technology also accepts wastewater, a critical feature for people living in areas where fresh water is scarce. As he did with the Nano and Swachch, Tata hopes Nocera’s solution will continue the group’s effort to serve the “bottom of the pyramid” in India and other emerging markets, and turn a profit while doing so, a Tata executive told the Hindustan Times. Sun Catalytix’s technology may become yet another compelling example of frugal innovation (which I’ve talked about here, and here) with Indian impetus. Frugal innovation is about re-designing consumer products to be significantly cheaper and therefore within the budgets of the billions of people in emerging markets who have some money but are not yet middle class. The difference with Sun Catalytix’s technology is that it may also be attractive to Westerners, especially if energy prices keep going up. I’ll certainly be pay attention to what happens. Placing a bucket of water on my balcony sure sounds a lot better than investing $10,000 in rooftop solar panels! This entry was posted in Business Strategy, South Asia and tagged Clean Energy, India, Innovation, Tata. Bookmark the permalink. This is phenomenal! And it works with wastewater! The cynical side of me says that this will mysteriously fade into the background or the technology will be usurped from the innovators and patented by an energy company, but let’s hope not.